Video w/local BMXer's Now Available! FBI! Check out local riders in the video trailer and purchase a copy for yourself (available locally at AZBikes.com). The Fence is actually finally fixed! "The Basin" freestyle BMX facility is now open to the public with the fence fixed. Of course, with special weather conditions such as snow, rain, etc., it'll be closed for safety reasons. 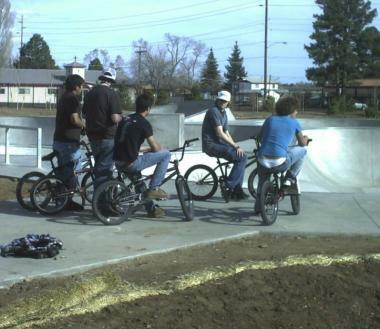 Click here to view the videos added to this Flagstaff BMX site. More videos to follow. Click here to view the photographs of local riders doin' their thang during the official opening day ceremonies. 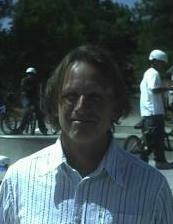 "The Basin," the local BMX bike park in Flagstaff, AZ officially opened on Saturday May 27, 2006 to the general public. Ryan Letcher, "Tuba Mike" Shirley, Steven Mueller, Doug Coffey, Justin Wilgus, Rion Williams, Brian Earnst, Felix Ponce and other Flagstaff local BMX bikers. Click on the image to see the photos. Click here to view the page of BMX freestyle bike tricks. Add your comments on the tricks or add a new trick which is not listed. Your comments are appreciated. dedicated to the technical and aesthetic needs of the experienced BMX rider. Created within a 2.2-acre detention basin that would have otherwise just been a vacant lot, 900 tons of concrete were used to create three irregularly shaped bowls, averaging eight feet deep, primed for tricks and exciting BMX maneuvers. Specific features included in the park area: the side rail, the central rail, the over-vert wall, two straight walls, and a wrap-around wall extending above the bowls. Location: The Basin is located on the corner of West & 6th Street (1700 E. 6th Street) in the Sunnyside neighborhood of Flagstaff. Occasionally the park will experience routine closures due to weather conditions for the safety of the local BMX freestyle bikers. The ideal surface for quality freestyle BMX tricks is also ideal for potentially dangerous situations under certain weather conditions. The slightest bit of moisture from rain, snow, hail and even fog, among other weather conditions, can create a less-than-desirable condition for safe and sane riding. Some of this information is taken from the Flagstaff, AZ Parks and Recreation webpage and city webpage. Some of this information is taken from the Flagstaff, AZ Parks and Recreation webpage.